Position -- Extension at Atlanto-Occipital joint. Barking dog / Sniffing the morning air position. Does not prevent aspiration of gastric contents. FAST TRAC / Intubating LMA -- for difficult intubation. Q. Major component of Sodalime is ? Aluminium hydroxide lattice -- adsorbs nitrogen, leaving a 95% oxygen mixture at the outlet. Silica used to absorb Water Vapour. Drugs to be stopped before surgery. 6. Lithium – stop 48 – 72 hrs before. Note: Smoking should be stopped 6wks before surgery. Even if not stopped then, it will still benefit if stopped 12hrs before surgery. Drugs that can be continued. STEROIDS : If patient took Steroid for > 1wk in last 1year – then intraop steroid replacement is necessary. Q. Which of the following forms the " body " of Scottie dog appearance on Oblique projections of the lumbar spine ? The scotty dog sign refers to the normal appearance of the lumbar spine when seen obliquely. Note : The terms communicating and noncommunicating hydrocephalus are used to indicate extraventricular obstructive hydrocephalus and intraventricular obstructive hydrocephalus, respectively. Non communicating Hydrocephalus = Intraventricular Obstructive. - Has large 4th ventricle. In Adults : Erosion of posterior clenoid process. Q. Middle mediastinal nodes drain all except ? The middle mediastinal nodes drain the lungs, bronchi, left heart , the lower trachea and visceral pleura. Right heart drains to Anterior Mediastinal Nodes. Leukocytoclastic vasculitis (LCV), also known as hypersensitivity vasculitis and hypersensitivity angiitis, is a histopathologic term commonly used to denote a small-vessel vasculitis. Fragmentation of neutrophils surrounding blood vessels. 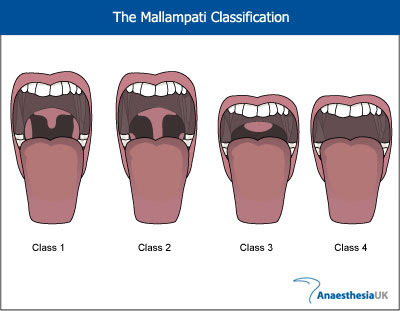 In anesthesia, the Mallampati score, also Mallampati classification, is used to predict the ease of intubation. O - Visualize tip of epiglottis. The Mallampati classification is a method to assess the tongue size in relation to the size of the oropharynx. The test is performed by having the patient sit with their head in the neutral position, and then open their mouth as wide as possible and protrude the tongue as far as possible. They should not phonate, as this can elevate the soft palate and alter the view. A Class 3 or 4 view may be associated with difficult laryngoscopy. 1. A normal healthy patient. 4. A patient with severe systemic disease that is a constant threat to life. 5. A moribund patient who is not expected to survive even with or without the operation. 6. A declared brain-dead patient whose organs are being removed for donor purposes. Q. Muscle relaxant not metabolized in human body ? In vivo data from humans suggest that doxacurium chloride is not metabolized and that the major elimination pathway is excretion of unchanged drug in urine and bile. 1. Which is the most common cause of headache among the following ? 2. Which is the least common cause of headache among the following ? Chest X-Ray taken in the position shown in image will be named ?